Olympic sprinting gold medallist Mark Lewis-Francis has been named on standby for Great Britain's provisional bobsleigh squad for next month's World Championships in Austria. Lewis-Francis took up the sport four months ago with the aim of competing at the Pyeongchang 2018 Winter Olympics. 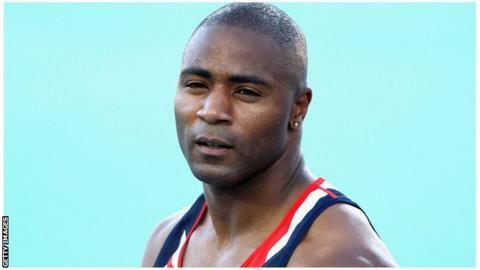 He won 4x100m relay gold at the 2004 Summer Games. GB performance director Gary Anderson said it was a "tough call" to leave the 33-year-old out. Instead, Britain have gone for a mixture of youth and experience in their squad. Lamin Deen, fifth in the World Championships in Winterberg last time out, pilots GB1 in the four-man alongside John Baines, Joel Fearon and Andy Matthews. Double Olympian John Jackson pilots GB2 with Bruce Tasker, Ben Simons and new recruit Tremayne Gilling. Winter Youth Olympics silver medallist Mica McNeil leads the British challenge in the women's competition alongside Natalie DeRatt. The World Championships take place on 12-21 February.